IAS are mandatory for the consolidated financial statements of all the listed companies in the EU for annual periods beginning on 01.01.2005, i.e. from 01.01.2004 for comparative data. Member states decide whether to impose or allow IFRS for company balance sheets and for unlisted companies. That option was implemented in Italy with the Legislative Decree of 28 February 2005 n. 38. Listed companies for consolidated financial statement since 2005. - have a number of bondholders exceeding 200. - banks and financial intermediaries (including SIM, SGR, finance companies). - insurance companies (only for the consolidated statement). Non-listed companies, both where consolidated financial statement and balance sheets. 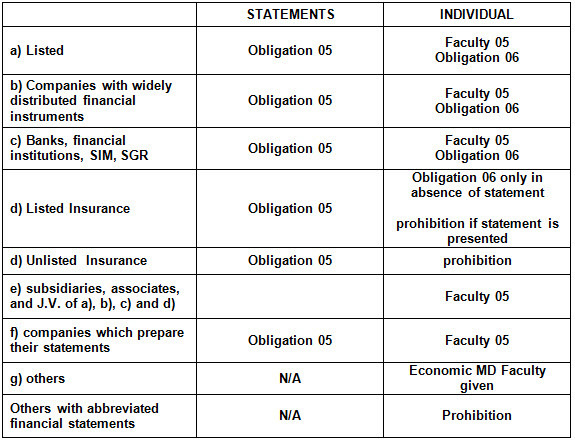 Companies included in a consolidated financial statement presented by a company that is “obliged” to do so. The application of the principles is optional and never mandatory. This ability to draw consolidated financial statements began in 2005. If the reference date for the first IAS / IFRS is December 31, 2005 and you opt for the presentation of comparative information for one year only, the result is that the date of transition to IFRS coincides with January 1, 2004, or with 31 December 2003 (which is the same thing). You need to submit a first-time adoption balance sheet with a reference date for the transition to IAS/IFRS. The assets and liabilities are those recognised by the IAS principles. The effect of the adjustments made to the opening balances of the various asset and liability accounts to make them consistent with IAS/IFRS principles has been recognised in a FTA first time application equity reserve. We look at the caso Fiat to illustrate the transition to IAS IFRS.